The word amaranth means "everlasting" in Greek, and this tiny seed has indeed endured the ages as an important food source for ancient civilizations in South America and Mexico. With the recent attention to healthier eating and plant-based diets, amaranth has seen a resurgence as a highly nutritious and gluten-free grain. From its high amount of fiber to its lower carbohydrate content, amaranth is a nutritional powerhouse that is the perfect addition to a gluten-free diet. Amaranth has more protein than wheat; whereas 1 cup of whole wheat flour has 16 grams of protein, 1 cup of raw amaranth contains 28.1 grams. Oats are a close second with 26.3 grams of protein. Raw white rice contains 13.1 grams, and white flour has 11 grams of protein. Lysine is an important amino acid (a building block of protein) and grains are notorious for having a low lysine content, which decreases the quality of their proteins. Amaranth is high in lysine, setting it apart from other grains; food scientists consider the protein content of amaranth of high "biological value," similar to the proteins found in milk. This means that amaranth contains an excellent combination of essential amino acids. Another advantage of the protein content of amaranth is that the primary proteins in amaranth are albumins and globulins. In comparison, the major proteins in wheat are called "prolamins," which are considered less soluble and less digestible than albumins and globulin proteins. The amount, types, and digestibility of proteins in amaranth make it an excellent source of protein. This gluten-free grain is high in several minerals, including calcium, magnesium, and iron. Amaranth is second only to teff—an African cereal that beats out all other grains when it comes to calcium content. 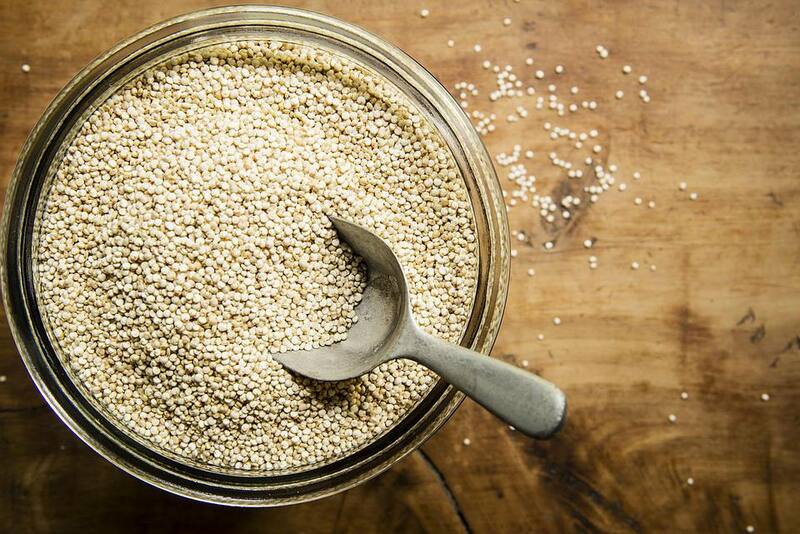 While 1 cup of raw teff contains 347 milligrams of calcium, amaranth has 298 milligrams. In comparison, 1 cup of white flour contains only 18.7 milligrams of calcium. Amaranth also contains more magnesium than other gluten-free grains. One cup of raw amaranth contains 519 milligrams of magnesium, which is followed by buckwheat with 393 milligrams, and sorghum (a warm-climate ancient grain) with 365 milligrams. In comparison, an equal amount of white flour contains only 27.5 milligrams of magnesium. The quantity of iron is also higher than compared to other gluten-free grains. One cup of raw amaranth contains 15 milligrams of iron; teff is a close second with 14.7 milligrams, and white flour contains 5.8 milligrams of iron. When it comes to fiber, whole wheat flour is a better choice than white flour since much of the fiber has been removed during white flour's production. Compared to 1 cup of wheat flour, however, amaranth has more grams of fiber—18 grams compared to 13. In addition, amaranth has more fiber than other gluten-free grains, such as buckwheat and millet where each contains 17 grams. In comparison, white flour contains 3.4 grams of fiber. As an added benefit, amaranth has fewer carbohydrates compared to other gluten-free grains. While oats contain 103 grams of carbohydrates, making them the lowest carb gluten-free grain, raw amaranth contains just 129 grams, putting it in second place. White rice is at 148 grams, while brown rice and sorghum total 143 grams; teff comes in at 141 grams of carbohydrates. When talking about healthy fat, you will often see olive oil and avocado listed, but whole grains are a good source of them as well. Amaranth is full of healthy polyunsaturated fatty acids, which help to lower bad cholesterol, improve heart health, and help to maintain the health of your body's cells. These fatty acids also contribute similar amounts of vitamin E compared to olive oil. When you add amaranth in amounts up to 25 percent of the total flour used in gluten-free recipes, you not only improve the nutritional value but also the taste and texture of gluten-free baked goods. Additionally, amaranth is an exceptional thickener for roux, white sauces, soups, and stews. Amaranth, by nature, absorbs water very easily, which is what gives it great emulsifying properties. But if amaranth is used as the sole grain in gluten-free baking recipes, baked goods become too dense; bread will not rise properly and pancakes and cookies become too heavy. The challenge and rewards of gluten-free cooking come from combining a variety of gluten-free flours, starches, and gums that work in unison to mimic the properties of gluten. Add amaranth to gluten-free flour blends to achieve the best texture.